Go-Betweens Bilbao, originally uploaded by alister. 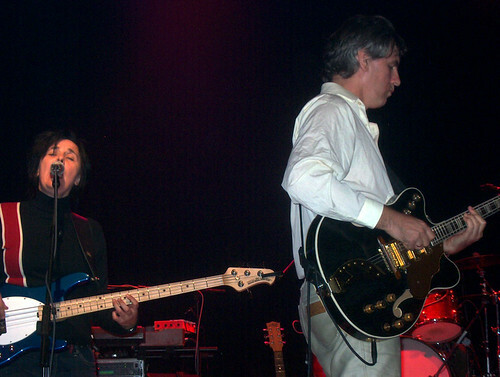 The Go-Betweens playing with the Delays and Teenage Fanclub as part of the Wintercase tour, Kafe Antzokia, Bilbao. November 3rd 2005. 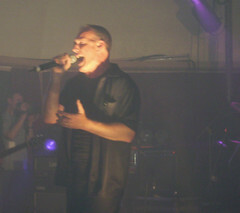 There were some initial sound problems with the band's monitors which led to Robert re-starting the second song twice. Later Grant ran into issues with his guitar and had to borrow Norman from Teenage Fanclub's guitar for 'Bachelor Kisses'. Despite that the band played a good set. I guess experience helps you keep your focus. They were not headlining so no encore, but highlight for me was 'Surfing Magazines'. As my companion and I tried to whip up the crowd we were at least acknowledged by Robert..."now everyone else join in!" he advised as he winked at us. The Go-Betweens are less well known than Teenage Fanclub in Spain, but seem to have won most of the crowd over. "Round and round, up and down, through the streets of Bilbao."